Microphone and build quality definitely put the Raw Prism in the budget category, but it has it where it counts: sweet sweet sound at a low price. SteelSeries has recently updated and expanded its range of headsets in a bid to cater to just about everyone who likes hearing their games and talking to people. The main Siberia remains a great overall package with its V3 redesign, representing great value for $100 despite minor mic issues and slightly underwhelming bass. But if you’re looking a little further down the price list, the $60 Raw Prism is a really enticing model, despite its name bringing to mind Kanye West’s arty side project. The major difference between this and the Siberia is in the earcup and headband design. It’s another closed-cup model, but this time with an adjustable band (rejoice, fellow tiny-heads!) finished with a generous cushioned pad. The same cushioning and fabric finish is used on the earcups themselves, and it’s very effective. If compromises have been made to reach this lower price point, it isn’t evident in the Raw Prism’s comfort. 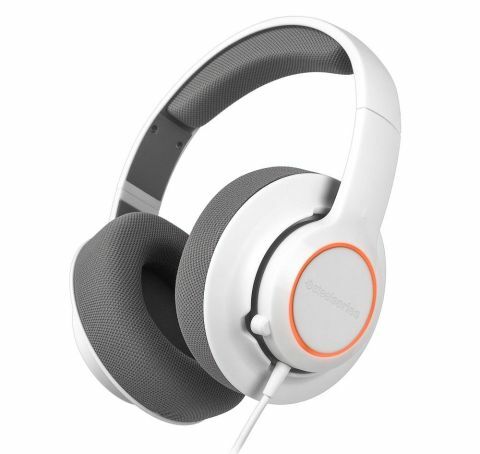 Though heavier than the Siberia V3, it too stays comfortable after hours of continuous use. The fit isn’t quite as snug around the ears, so it does let in a bit more external sound. After 2-3 weeks of use the fabric covering those cushioned earcups began to fray, so overall build quality is less convincing in the Raw Prism than its more expensive bigger brothers. There’s just the hint of audible creaking from its moving parts too, which is a telltale sign of production costs. It’s a shame to have to mention that, because elsewhere this headset really nails it. Sure, visual appeal is subjective, but it’s unlikely that too many will find the Apple-meets-Aperture-Science look of the Raw Prism objectionable. And while this writer will die before condoning coloured lights on gaming peripherals, there are obviously plenty out there who lap every violet LED right up. Begrudgingly, I’ll consider the customisable colored light ring on each earcup a plus point—there are 16.8 million colours to pick using SteelSeries’ own Engine 3 software, and transitions are programmable too. Sound quality is a pleasant surprise. There’s actually not much in it between this and the pricier Siberia V3 model, the latter just edging it for clarity in the mid- and high-mid range. Neither model produces show-stopping bass, but it’s much easier to forgive the Raw Prism for that at $60, and subdued bass is always preferable to exaggerated, cheekbone-shattering low-end distortion. Being compatible with the Engine 3 software previously mentioned, it’s also tweakable within a few provided presets, though fewer than more expensive models in SteelSeries’ range. The mic setup here is a discrete internal one designed not to ruin the Raw Prism’s unfussy look and smooth lines, but unfortunately that brings with it a few problems. Since it isn’t adjustable, it’s harder to achieve your desired volume while maintaining a clear signal than with a traditional mic design. The Siberia V3 headset suffers a very similar problem, although that mic is mounted to a bendable and retractable boom. The SteelSeries software’s mic optimisation goes some way towards fixing this, but it’s hard to strike the balance between avoiding a muffled sound and keeping the signal cool enough to avoid distortion and noise-cancelling cut-offs. The other consideration to make when looking at this setup is that it operates via USB interface rather than 3.5mm audio jacks. For some that’ll be another welcome aspect of the Raw Prism’s simple design and ease of use, but for others it means the inability to use it with soundcards. There’s no inline remote or mic mute button to be found here either, so you’ll have to designate multimedia controls to either your keyboard or OS. The areas I found the Raw Prism lacking didn’t put me off the package as a whole. Importantly, it ticks the boxes of sound quality and comfort confidently, and those are two elements you don’t want to compromise on within any price bracket. The clean, sleek look is a bonus—enough to keep you sweet when adjusting software settings to find a workable mic level.